Winemaker’s Notes: This bright, pale-golden wine opens to aromas of white fruits and flowers. On the palate, it is nicely balanced with freshness provided by the Clairette while the Grenache gives it body and a gentle softness. My Review: We’re getting to the time of year where I don’t drink as many whites; the temperature dropping leads me to trend towards reds with big bodies and flavors. 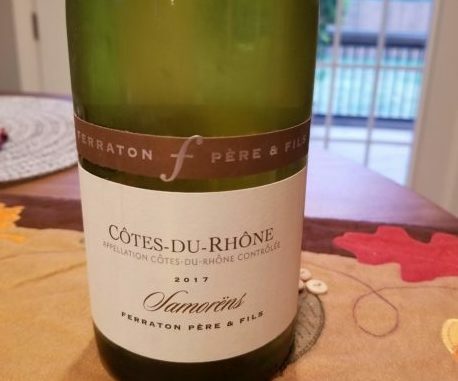 That does not, however, mean I never open any whites, and the 2017 Ferraton Pere & Fils Cotes-du-Rhone Samorens Blanc was a good one to open recently. In the glass the wine showed light yellow colors with slashes of green. On the nose I picked up tropical notes and a touch of vanilla, both of which carried through to the palate where the wine showed a touch of creamy, roundness on the finish that would lead me to think the wine had been briefly oaked (it hadn’t). My wife and I paired the wine with some chicken ramen we made on a cold, rainy day, and the wine was well balanced to the task, providing some bright notes against the round, umami flavors of the ramen. I really enjoyed this wine, and for the price it’s a great value as we head into the holiday party season – versatile enough to go with a number of dishes, but priced well enough that you can grab more than one bottle.